I'm a huge fan of Dawn O'Porter's TV show "This Old Thing", which is currently showing on Channel 4 on Wednesday evenings. When I met Dawn back in April (see here) she was so enthusiastic about her love for vintage fashion I couldn't help but be completely intrigued by the concept of dressing in pre-owned clothes. 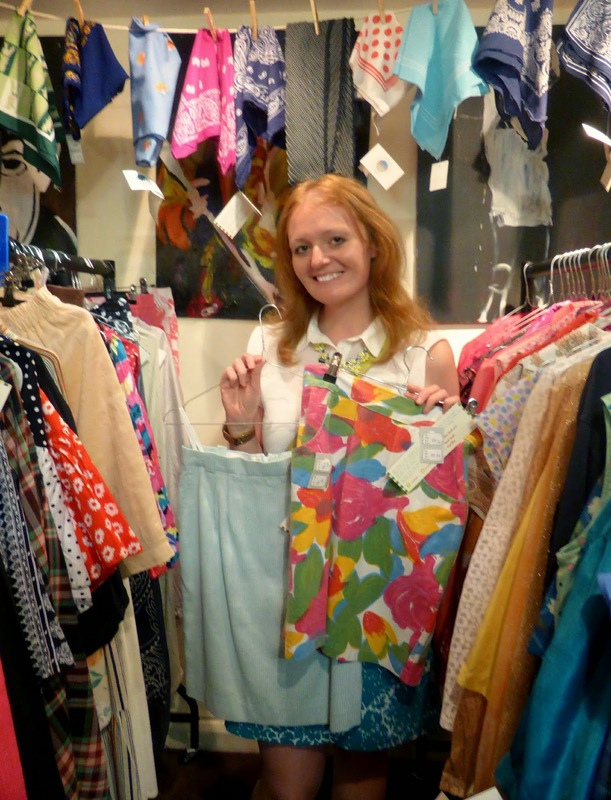 Dawn is on a mission to introduce vintage fashion into people's lives. Fabulously dressed in the most amazing outfits that she's discovered buried in shops, Dawn promotes the idea of loving the story behind old clothes and buying good quality timeless pieces that make you stand out from the crowd. So, for quite a while now, I've been wanting to have a good rummage for some old treasures myself, but being a complete virgin to vintage clothes shops the idea was a little daunting. I'm very happy and confident on the high street, I know which shops I love, what clothes and sizes I look good in and what the latest trends are but shopping vintage is a whole new world. 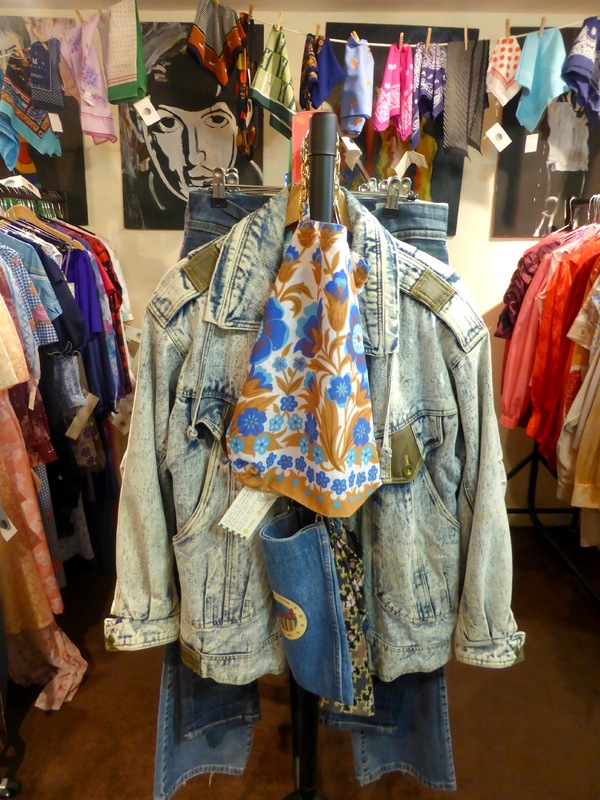 Shopping in a vintage store encourages you to trust your inner fashionista, think outside the box and take brave bold decisions. It's not for the fainthearted and a girl's first time can be a little overwhelming. 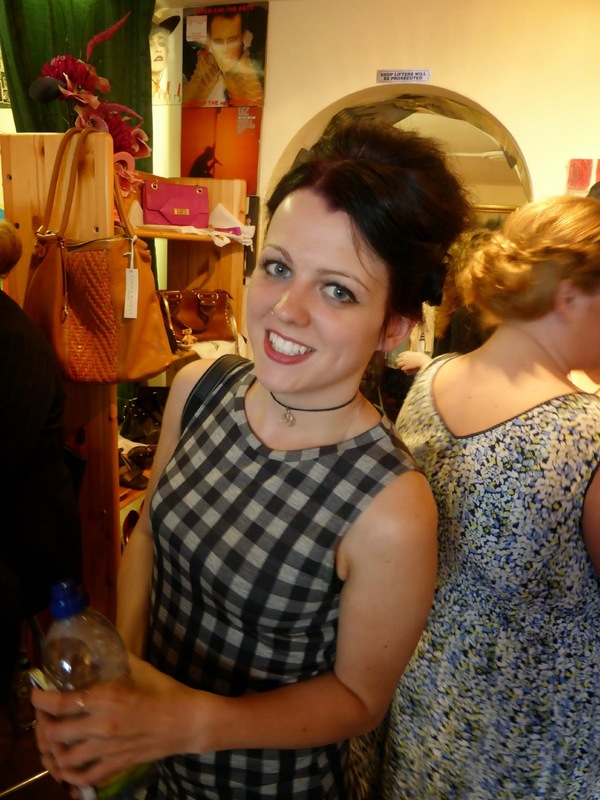 So I was very happy when my lovely friend and local blogger Kayleigh announced that she was teaming up with Scout , a vintage clothing store in Sunderland, to put on an event for bloggers. I was finally going to be able to try out some shopping with a nice large group of blogging girlies for moral support. Scout is a real cave of wonders and from the second you walk down the steps and into the store you are met with bright colours and friendly smiles. 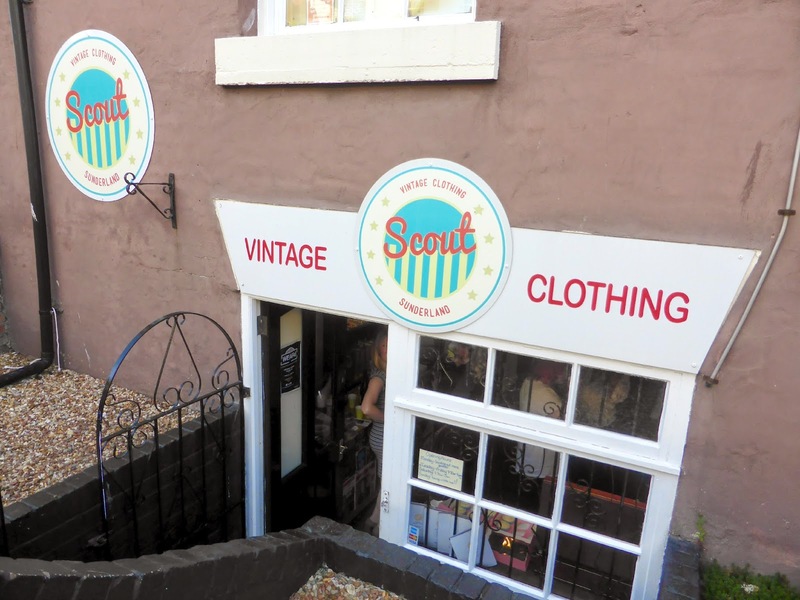 If you're a newbie to vintage shopping and living in the North East, Scout is a great shop to make your debut. 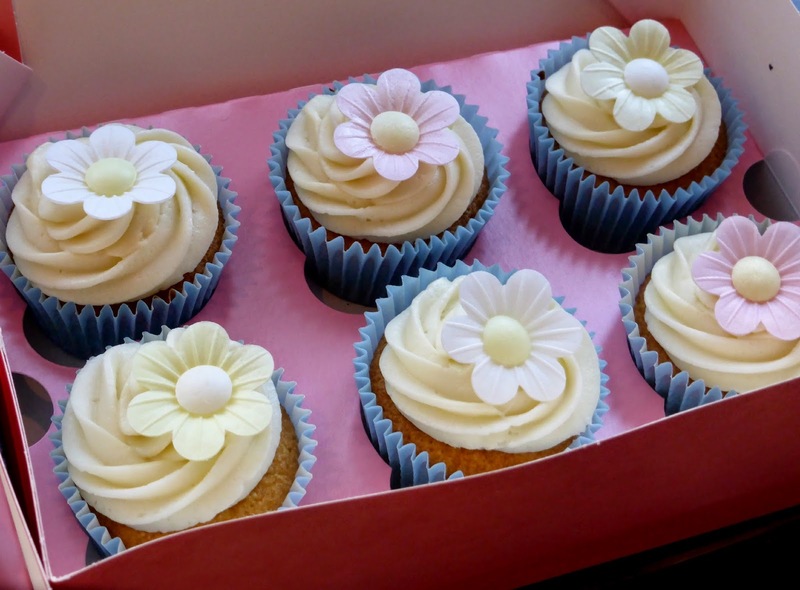 I was a bit nervous about starting my hunt through the rails of clothes, and so spent a little while psyching myself up with some cupcakes that had been made for us by Scout's neighbour, Serendipity, a lovely little tea room a few doors down. That was soon followed by some sparkling wine, strawberries and cream and a few handfuls of popcorn. Once the sugar had kicked in I felt ready to dive in. I found some amazing patterns and colours but they were a little too much for a beginner like me so after marvelling at some of the beautiful cuts and shapes of the dresses and reminiscing about the time when my Mum's wardrobe was full of shoulder pads I moved to the next rail. I found a gorgeous little cropped denim jacket that I really could have seen myself wearing but as I already have one quite similar (although nowhere near as nice!) I decided to move on, feeling a little more confident that I could find something to suit my style. In the end I found a rail that had some real potential, the skirts. Vintage skirts aren't quite as daunting as the dresses and I quickly found two that I really loved. A cute mint green and white striped skirt (bang on trend pastel) and a very vibrant skirt covered in beautiful bold colours (great for Summer). Unfortunately both skirts were too small and I eat far too much cake to ever fit into anything teeny but I was so happy that I found some things I really loved to try on and it's definitely given me the confidence to give it another go. Whilst I was dancing around in the changing room trying to squeeze myself into my small skirts some of the other girls were having their makeup done by the talented Tamzin Cummings and vintage hairstyles were being created by The Black Door Hairdressing. My favourite style of the night was Kloe's Beehive which looked absolutely incredible. As the shop began to fill with happy bloggers things soon began to get a little toasty in the Summer heat so I decided to grab an iced latte from Holmeside Coffee who had popped down with some refreshments to cool us all down. 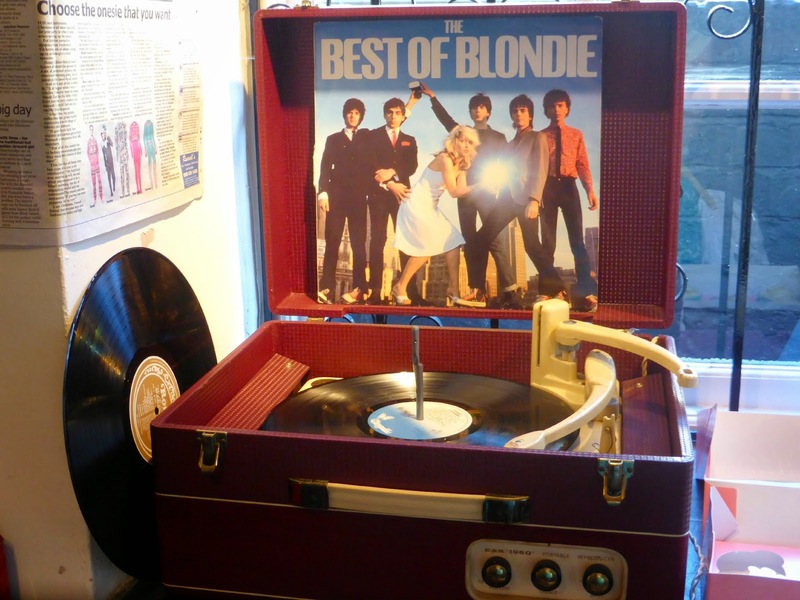 It was then I noticed that the Blondie and Bee Gees tunes I'd been grooving away to in my head (I just about resisted the urge to launch into a full on dance routine in the middle of the shop) were being played on an old record player. Absolutely amazing and it made my night even more perfect, fantastic old tunes on vinyl in a store full of wonderful old clothes. I thoroughly enjoyed my first taste of vintage shopping and something tells me that this could be the beginning of a wonderful new hobby. Thank you so much to Kayleigh for organising and Angela for letting us take over her lovely store and all the local businesses who provided us with refreshments, pampered us with hair and makeup and filled our bags with goodies. Ooh sounds like a lovely little event! A shame I missed it! You have such great natural style I bet you'll find some amazing vintagey bits when you dive back into it. I'm always a little bit wary of that and charity shop shopping because I'm completely useless and picking separates to go together. And with coffee and cake! Bonus. Awww thanks, I wish I did! I'm always very jealous of all the fashion bloggers who put clothes on and look amazing, I don't have much of a clue really :D I'm good at coffee and cake though! It was so nice to see you! I still need to write my post haha. There were so many nice clothes in the store, I'm definitely going to take a trip back! Me too, I need to head back as soon as there's some new stock! I want to do a full of fashion parade through those rails! I was very happy I had a lot of people in there with me to hide behind! So sad I couldn't make it, sounds like a great do! Me too! Dawn O'Porter always looks AMAZING! I love her look!